Author: Dunning, John Set In . . . Description: Cliff Janeway is back! 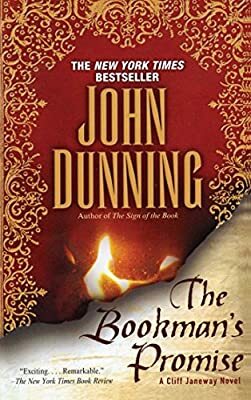 The Bookman's Promise marks the eagerly awaited return of Denver bookman-author John Dunning and the award-winning crime novel series that helped to turn the nation on to first-edition book collecting. First, it was Booked to Die, then The Bookman's Wake. Now John Dunning fans, old and new, will rejoice in The Bookman's Promise, a richly nuanced new Janeway novel that juxtaposes past and present as Denver ex-cop and bookman Cliff Janeway searches for a book and a killer. The quest begins when an old woman, Josephine Gallant, learns that Janeway has recently bought at auction a signed first edition by the legendary nineteenth-century explorer Richard Francis Burton. The book is a true classic, telling of Burton's journey (disguised as a Muslim) to the forbidden holy cities of Mecca and Medina. The Boston auction house was a distinguished and trustworthy firm, but provenance is sometimes murky and Josephine says the book is rightfully hers. She believes that her grandfather, who was living in Baltimore more than eighty years ago, had a fabulous collection of Burton material, including a handwritten journal allegedly detailing Burton's undercover trip deep into the troubled American South in 1860. Josephine remembers the books from her childhood, but everything mysteriously disappeared shortly after her grandfather's death. With little time left in her own life, Josephine begs for Janeway's promise: he must find her grandfather's collection. It's a virtually impossible task, Janeway suspects, as the books will no doubt have been sold and separated over the years, but how can he say no to a dying woman? It seems that her grandfather, Charlie Warren, traveled south with Burton in the spring of 1860, just before the Civil War began. Was Burton a spy for Britain? What happened during the three months in Burton's travels for which there are no records? How did Charlie acquire his unique collection of Burton books? What will the journal, if it exists, reveal? When a friend is murdered, possibly because of a Burton book, Janeway knows he must find the answers. Someone today is willing to kill to keep the secrets of the past, and Janeway's search will lead him east: To Baltimore, to a Pulitzer Prize-winning author with a very stuffed shirt, and to a pair of unorthodox booksellers. It reaches a fiery conclusion at Fort Sumter off the coast of Charleston, South Carolina. What's more, a young lawyer, Erin d'Angelo, and ex-librarian Koko Bujak, have their own reasons for wanting to find the journal. But can Janeway trust them? Rich with the insider's information on rare and collectible books that has made John Dunning famous, and with meticulously researched detail about a mesmerizing figure who may have played an unrecognized role in our Civil War, The Bookman's Promise is riveting entertainment from an extraordinarily gifted author who is as unique and special as the books he so clearly loves.